Available at the Welcome Center! Home>Available at the Welcome Center! 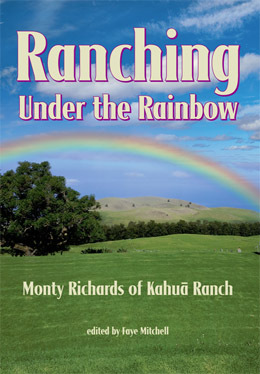 NKCRC is proud to announce the release of “Ranching Under the Rainbow – Monty Richards of Kahua Ranch.” Featuring many never-before-published photos from the Richards family private archives, this oral history is more than the story of Monty’s life, it is the story of Kohala’s rich ranching history as it has been lived for generations at Kahua Ranch. Over twenty-five hours of oral history are transcribed here, all told with the well-known humor and love of the Hawaiian people that is Monty’s trademark. This book is published by Living Journals, a sponsored project of NKCRC under project organizer and editor Faye Mitchell. A perfect gift for anyone with an interest in Kohala’s ranching history or someone who just enjoys a good story! 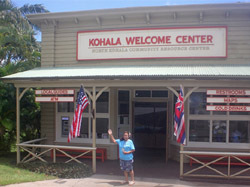 The book is available for $20 at the Kohala Welcome Center or at the online store on our website (shipping costs apply). Click HERE to order, or stop by the Center, Monday through Thursday, 9 am to 4 pm or Friday, 9 am to 3 pm. By editor|2017-11-07T06:10:05-10:00November 7th, 2017|Categories: Welcome Center|Comments Off on Available at the Welcome Center!